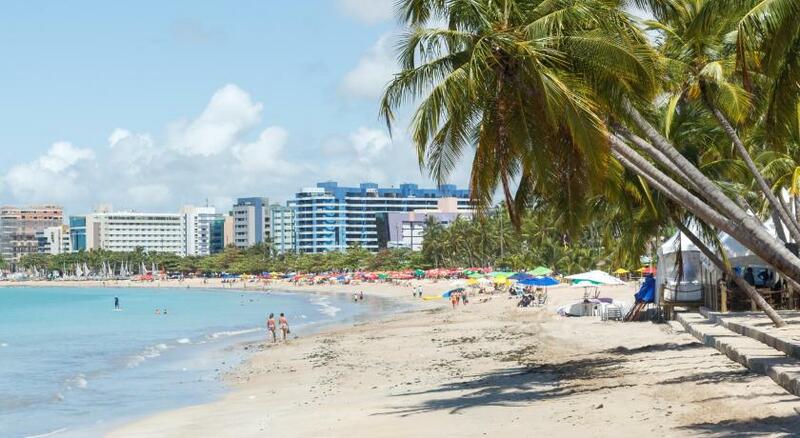 Lock in a great price for Palms Tropicalis Hotel – rated 8.7 by recent guests! Great location and very friendly and helpful staff. The hotel is very clean and breakfast very good. Perfect place to stay. La atención y amabilidad del personal, excelente. La ubicación muy buena, cerca de playas, supermercados, restaurantes. Las instalaciones muy bien en cuanto a relación precio/calidad. Lo recomendaría totalmente. Tudo com exceção das pequenas falhas que não deveriam existir. 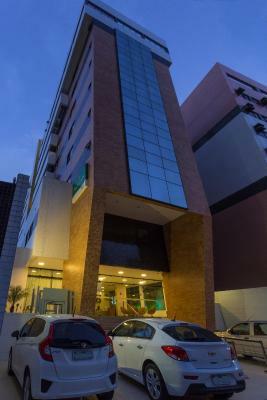 A localização do hotel é ótima, o atendimento dos funcionários é sensacional, o quarto é bem espaçoso. Atendimento, atenção e simpatia dos funcionários. 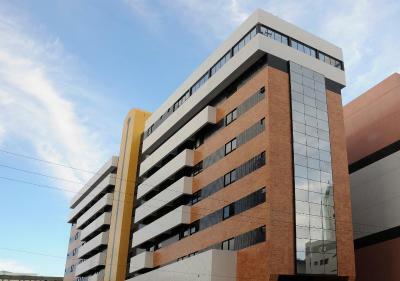 Observaram no checkin que meu aniversário seria no período de hospedagem e deixaram um bolo de cortesia no meu quarto na data. Funcionários mto atenciosos, café da manhã gostoso e ótima localização! Café da manhã excelente. Funcionários muito prestativos e hotel muito bem localizado. 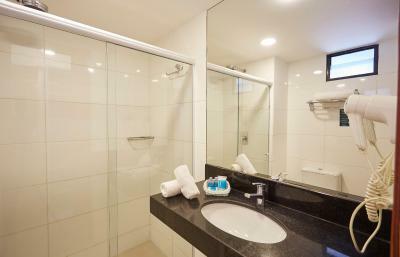 Palms Tropicalis Hotel This rating is a reflection of how the property compares to the industry standard when it comes to price, facilities and services available. It's based on a self-evaluation by the property. Use this rating to help choose your stay! One of our top picks in Maceió.Tropicalis Hotel is a tasteful beach hotel one block from Ponta Verde Beach, in the center of lively Maceió. 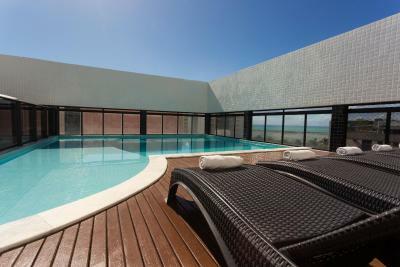 The rooftop pool and decked sun terrace offer panoramic beach views. 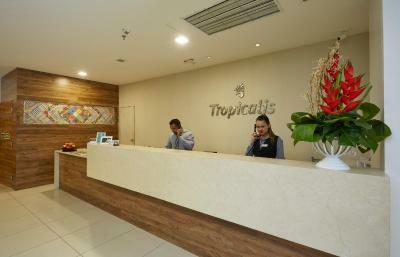 The floodlit rooms at Tropicalis Hotel have bright white décor with touches of light woods and tropical themed bedding. 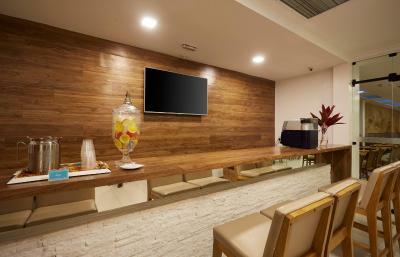 All are equipped with air conditioning, cable TV and queen beds. 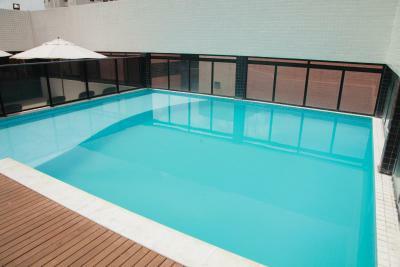 Guests at the Tropicalis can benefit from the hotel´s free Wi-Fi. Parking is also free but subject to availability. A daily breakfast buffet with tropical fruits, natural juices and pastries is available. The restaurant serves a variety of regional seafood dishes and exotic cocktails. 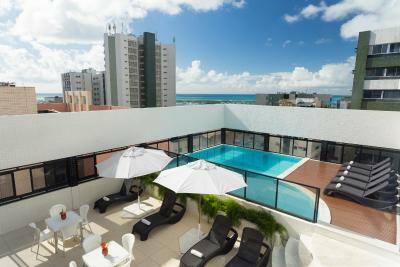 Tropicalis Hotel is a 25-minute drive from Maceió Airport. It offers a convenient car rental service. When would you like to stay at Palms Tropicalis Hotel? Specially decorated with romantic details and flower petals, this spacious room welcomes guests with a bathrobe, national sparkling wine, a varied breakfast served in the room and special amenities. 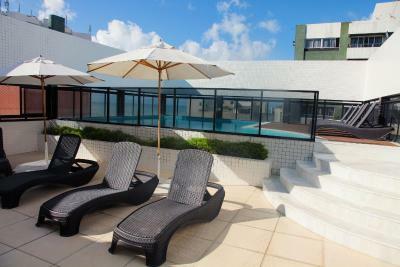 The room is fitted with air conditioning, a TV with cable channels, a mini-bar and a telephone. 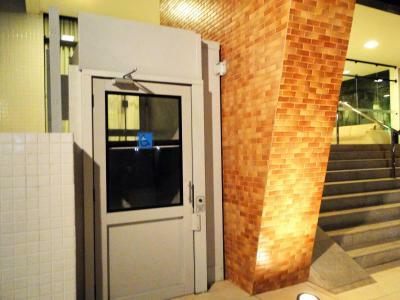 The private bathroom includes a shower and a hairdryer. House Rules Palms Tropicalis Hotel takes special requests – add in the next step! Palms Tropicalis Hotel accepts these cards and reserves the right to temporarily hold an amount prior to arrival. The hotel kindly asks guests to send a copy of the credit card used to secure the reservation, along with a copy of an official ID/passport and a filled and signed payment authorization form (if the credit card does not belong to the guest). The hotel will send the form via e-mail after booking.